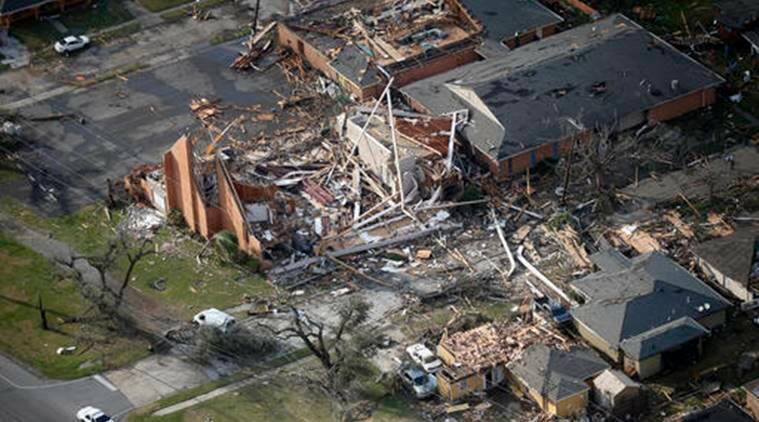 Louisiana Gov John Bel Edwards viewed the damage during an aerial tour and declared a state of emergency. Hours after a tornado struck eastern New Orleans, hatchet-wielding firefighters walked up and down the debris-strewn Chef Menteur Highway, looking for anyone missing or trapped. “I’m homeless now,” said Malcolm Ballard, 65, outside the heavily damaged Royal Palms Motel. Inside, his room was ransacked; the furniture and carpet soaked by rain that poured in after the storm blew open the door and broke the windows. At least two other confirmed tornadoes touched down in southern Louisiana, wiping houses from their foundations, downing power lines and leaving 10,000 homes without electricity before moving across the Deep South. Dozens of injuries were reported, but no fatalities. New Orleans Mayor Mitch Landrieu said at least two of the injured were seriously hurt. Louisiana Gov John Bel Edwards viewed the damage during an aerial tour and declared a state of emergency. The storm flipped over cars, tore roofs off homes, ripped through a gas station canopy, broke tall power poles off their foundations and flipped a food truck upside-down. It left a couch resting improbably on a pile of debris in the middle of a road, and trapped a truck driver as power lines wrapped around his cab. The wall of severe weather also delivered heavy rain and hail to Mississippi and Alabama. The national Storm Prediction Center in Norman, Oklahoma, said 2.7 million people were at risk across the region. Press Secretary Sean Spicer said the White House was monitoring the severe weather, and President Donald Trump would be reaching out to local and state officials throughout the day. Kevin Ballard, 56, came to check on his older brother at the damaged motel, but his own injuries turned out to be worse. He was at an auto repair shop when the apparent tornado hit, collapsing the shop around him. He had bruises and cuts on the back of his head and neck. “I was standing in front of the building at first and I seen something black, twisting,” Kevin Ballard said. “Tires and everything fell on the back of my neck and head.” Yoshekia Brown lost everything to Hurricane Katrina in 2005. Now she’s lost everything again: Three-quarters of her home in New Orleans East is now collapsed. Brown said she was at work when she got a weather alert on her phone. She looked at a weather map and realized it was her neighbourhood, then drove home to check. On the way, her brother called and said, “Sister, your house is gone.” She didn’t believe it.